Frederick Johnson of Genentech, Inc. is one of many experts presenting at Q1’s Life Sciences Manufacturing Automation Optimization Conference this April. His co-presentation, “Digitizing Automation for Enhanced Data Collection & Processes,” with Iris Scott of Genentech, Inc. dives deep into data integrity and streamlined data collection. Learn more below! Currently, I am a Senior Manager within the Genentech PT Information Technology business unit, which supports the Biologics Drug Substance manufacturing operations. The drug substance manufacturing process develops a finished or partially finished biologic product, which is then transferred for final processing and packaging as a finished good to our patients. Overall, the team I manage implements, manages and supports both global and local manufacturing information systems across multiple drug substance manufacturing sites located in the United States, Europe and Southeast Asia. Can you name a few specific benefits of the advancement of data collection within the automation industry? Data collection is not so much of an internal benefit anymore as it is a requirement. Years ago, we talked about all the great internal benefits of doing data collection, but that’s not the case anymore. Today, the paradigm has changed, where data collection is a requirement that enables the business to satisfy regulatory compliance to meet the changing needs of our patients. A major part of that requirement is adhering to FDA regulations. When we produce a product, we must be able to demonstrate to the FDA that we were in control of that product, from order execution to its state as a finished product. One of the primary ways we achieve this is through our batch record process, which is derived from the Master Batch Record. The batch record report is a document that states exactly what we did to produce a particular product given the instructions within the Master Batch Record. In order to create a batch record report, we need to collect data. In the past, much of this work was done through a manual process. Of course, with the introduction of Control Systems, MES and ERP solutions, these processes are nearly all automated now, with only small to moderate portions of the work as manual processes. With this in mind, there are certainly many benefits given the advancement of data collection. However, I see the ultimate benefit of data collection, with in my organization, is being able to enhance or save the lives or our patients with the products we produce. What are some of the biggest challenges when it comes to data collection and security? From my perspective, the biggest challenges I see is Data Integrity with respect to Data Governance. Through a computer system validation process, we ensure what happens on the shop floor actually gets recorded correctly into databases, or when we are passing data to another system, like an MES or an ERP system, that we’re passing the correct data as it was originally recorded in the source system. Of course, all of this rolls up into an area known as “Data Governance,” which is essentially the approach that any organization takes to manage the availability, usability, integrity and security of data used throughout the company. First of all, we want people to understand what they’re doing, in terms of data collection and coming up with a solution for data collection, is not about collecting the data. It’s really about meeting the needs of the business and business partners. Secondly, we want people to know how to effectively meet that goal. Finally, we want attendees to understand the solution. The idea really comes down to how to effectively meet business goals. You can collect data all you want, but the most important idea is understanding that businesses have needs and those needs have value. We’re going to cover how to maximize that value, which includes the use of an agile approach to project management and talking about the minimum valuable product (the MVP) as well as how agile can help meet demand or a customer’s or business’s goals very quickly. Why do you think manufacturing automation engineers should attend this conference? I believe people should attend the conference, not necessarily for this particular session, but because the conference is going to provide broader opportunities for networking. From my experience, the nature of this conference can provide an exchange of ideas across industries. Interacting with others can provide insight into the problems facing other industries that other people have already solved. It will also provide access to new and emerging technologies that are solving problems some organizations haven’t even thought about yet. Additionally, attending sessions, like the one Iris and I are putting together, will bring insight to the project management area and the understanding and aligning of business partners, which is really what, in the future, automation engineers are going to have to do. They’re going to have to be able to stand in front of their business partners and offer solutions before the business even asks for them. Attendees can get a peek into the future of where manufacturing automation is going, such as project management, agile perspective or product owner perspective, to provide value to businesses very quickly. 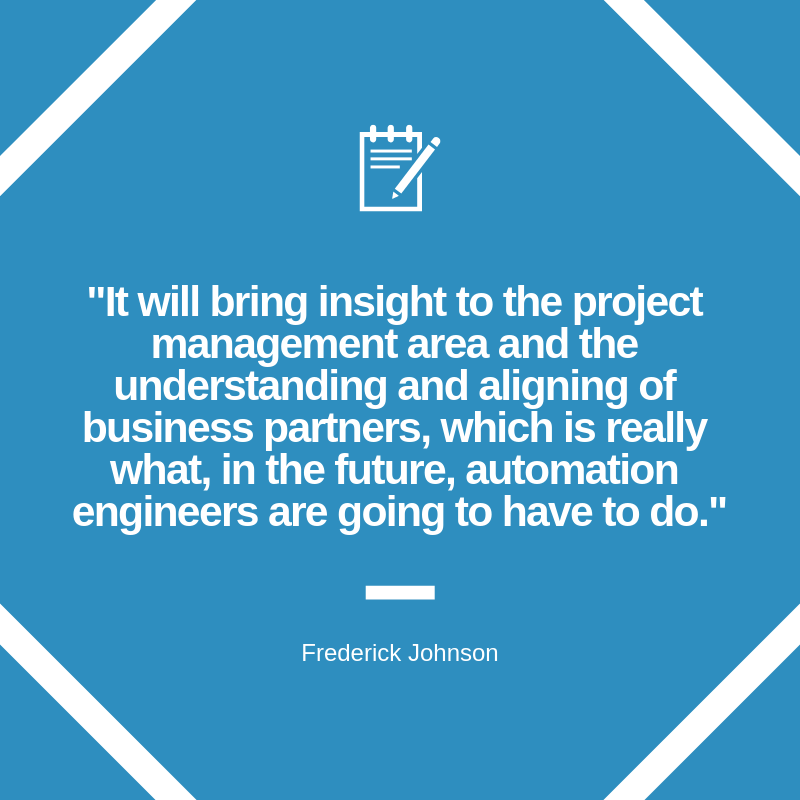 Save your spot for the manufacturing automation optimization conference today to hear more from Frederick Johnson.